This detached property offers flexible living accommodation and can be used as a family home with 2 B&B letting rooms and a one bedroom attached gîte. It is predominantly double glazed with pvc shutters to most windows. The electrical wiring system has been upgraded and a new flue pipe has been fitted to the woodburner. A new all water septic tank was installed in 2017. Viewing is recommended to appreciate the possibilities of this house. 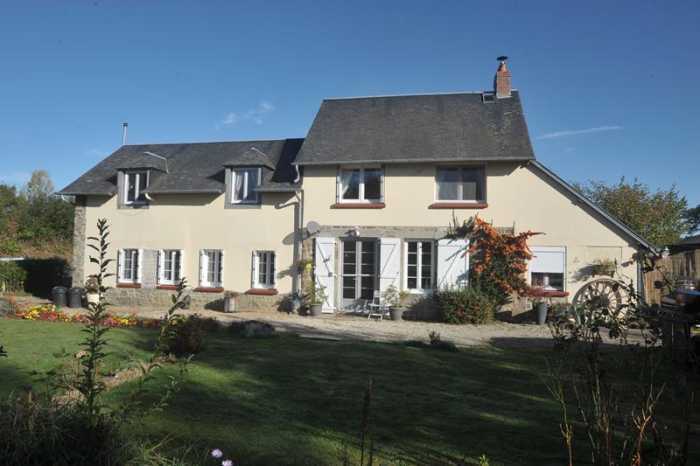 The house is conveniently situated near a village with hairdresser, bar/restaurant, bakery, small supermarket and several antique shops with further amenities at Mortain where you will find shops, schools, doctors' surgeries, supermarkets, etc. and local walking, and fishing. Extensive recreational facilities can be found nearby including local waterfalls and walking clubs, canoeing and outdoor sports. Major towns such as Caen, St Malo, St Lo, Falaise, Bayeux, Honfleur and Northern Brittany available for day trips. Normandy landing beaches are easily accessible. Suisse Normande and Spa towns 35 minutes drive. Choices of Golf Clubs with open availability for non members. Large French Mobile home site within 50 minutes for all resort facilities… pedaloes, canoe, football, fishing, pools with slides, snooker , entertainment. Sports centre with pool and slides, Go Karting and board park less than 15 minutes. Local village with many bars restaurants and shops. Weekly market on a Tuesday in Sourdeval, including Livestock. 20 mins to Bowling, sports centers and 18 hole golf course and the forest of Saint Sever. Beaches within an hour, river activities/ forests/ spa resort within 45 minutes. The closest airports to the property are at Rennes (81 km), Dinard (83 km) and Deauville (118 km). The UNESCO heritage site of Mont St Michel is 41 km away. Ferry Ports are at Caen (50 miles), St Malo is 1 1/2 hours away and Cherbourg is 2 hours. Calais and the Euro Tunnel are approximately a 5 hour drive and the nearest train station is at Vire (15 miles) from where you can take a fast train to Paris. Lounge/Dining Room 5.91 x 5.34m Tiled floor. Window and glazed double doors to front elevation. Exposed beams. Stone fireplace with wood-burner. Stairs to first floor. 2 radiators. Telephone socket. Kitchen 3.61 x 3.36m 2 windows to front elevation. Radiator. Base units with worktops and tiled splash-backs. Space for free standing cooker with extractor over. Stainless steel sink with mixer tap. Space and plumbing for dishwasher. Inner Lobby Tiled floor. Connecting door to Gite. Cloakroom Part tiled walls and floor. WC. Utility Room 1.9 x 1.48m Space and plumbing for washing machine. Hot water cylinder. Tiled floor. Vent. En-Suite Wet Room 2.72 x 2.38m Large walk-in shower. Heated towel rail. Extractor fan. Pedestal basin. WC. En-Suite Shower Room 2.38 x 1.48m Velux window to rear elevation. WC. Sloping ceiling. Pedestal basin. Heated towel rail. Shower with jets. Bedroom 3 2.98 x 2.93m Window to front elevation. Radiator. Bedroom 4 4.19 x 3.13m Window to front elevation. Radiator. Telephone socket. Shower Room 3.123 x 1.34m Large shower. Obscured glazed window to rear elevation. Partly tiled walls. Radiator. Pedestal basin. Cloakroom Obscure glazed window to rear elevation. WC. Hand basin. Bedroom 1 3.89 x 3.77m Window to front and west elevations. Convector heater. (Shower Room to be fitted). Boiler Room 7.75 x 2.50m Partly glazed door and window to rear elevation. Boiler and oil storage tank. The garden is laid to lawn with mature hedges, flower beds and borders and trees including cherry, apple and pear. Soft fruit bushes including raspberries and blackberries. Chicken coop. 3 corrugated iron sheds/garages. Mains water, telephone and electricity. All water septic tank installed in 2017. Oil fired central heating in the main house and electric heating in the gîte.